I’ll let you in on a little secret … my fiancé and I love going out to eat. It’s not the best habit to get into but we love food! I’ve been meaning to write about our food adventures so, here goes. I’m going to start with our favorite Minneapolis restaurants. I don’t have pictures but I will start posting pictures soon. Buckboard Restaurant in Lakeville: This is a dive. Remember the TV show Alice? That’s Buckboard. However, do not let the appearance fool you. The food is terrific! They serve the basics-hamburgers, malts, great breakfast food. My favorite: Egg White omelet with mushrooms, toast and orange juice. If you want a filling meal, go to Crossroads. They have delicious deli food. I just had their fish sandwich but they have beautiful breads, pickles, cookies, cakes and ice creams. My favorite: Bridgeman’s flavor of the day. Good pizza. Great chicken and dessert pizza! I went to Pizza Ranch the first time for the pizza however, I keep coming back for the chicken. Yum! Their chicken is crispy and not greasy. Delicious! They staff is friendly and always attentive without being annoying. Go support your local Pizza Ranch. My favorite: Chicken and peach dessert pizza. I was hesitant about including Firelake because I did not want anyone else to know about it. This restaurant is the best in town and they are not busy. We never had a bad meal there: breakfast or dinner. The service is perfect. They even gave us free dessert for saying it was our favorite restaurant. This is the question I’m asking today … Is it just me or is it hard to tell the difference between an actress and a mental patient or a singer and a stripper. Trust me.. this will make sense. What do you think of when I say Amanda Bynes? Five years ago she was known as a Disney (or was it Nickeloden) star. However, today she is going down the path of Britney Spears and Miley Cyrus? Over the weekend, Bynes made headlines by throwing a bong out of her 36th floor apartment building window and then she was arrested. She went to court wearing an odd blonde wig but seemed to be intelligent in front of the judge. One has to ask oneself, is she creating this drama to become a bigger star? In today’s world, it is a shame that the biggest stars are the biggest train wrecks. Bynes has not made a movie or appeared on television in years but she is now in the media every day for outrageous activity. The scariest result of this behavior is the example it sets to young people. Instead of seeing Annette Funicello as a Disney role model we see Miley Cyrus and Britney Spears. Sad. Next, is she a stripper or singer? Now, I know many people see Beyonce as a powerhouse singer and dancer. I personally see her as a curly cue singer. By this I mean, she does not hold the note. Last night in Copenhagen, Beyonce was performing and a fan reached up and slapped her behind. She had him escorted out of the arena. Now, Beyonce is a millionaire and known for being a world famous singer but I’ve always wondered…. If someone is performing in front of millions in little or no clothing, shouldn’t one expect this from a fan? I doubt Adele or Barbra Streisand would expect it. How Refreshing …. Celebrities with an Education! It’s graduation season-a time when twenty-somethings are going out into the world to work at their chosen profession. However, it is very rare to see a graduate who is older and also successful in another chosen profession. How refreshing! She did not rest on her laurels as a TV star. Longoria completed her degree the old fashion way. She worked for it! Congrats! My thoughts and prayers are with those in Moore, Oklahoma. Tonight is the finale of American Idol. A handful of years ago, the finale was must-see TV. Millions of viewers would tune in to see who America crowned as the next music sensation and the show delivered show stopping performances. The show also produced superstars such as Carrie Underwood and Kelly Clarkson. Now the stars do not shine as bright and the ratings are down. Has Idol lost its way … or is the audience just moving on? The winners are not superstars. From David Cook to Kris Allen, the singers do not have name recognition and would be hard pressed to sell out a local ballroom in my hometown. So what went wrong? Here are a few of my theories. 2. We are saturated with Idols. The show has been on 12 years. There are so many Idol winners, runner ups and also-rans that we are bored. 3. We miss Simon. Come on, we all have to agree that Simon told the truth but in a classy way with a beautiful accent. He, in many ways, was the voice of America. 4. The talent well is dry. I threw this one in because after last season this seemed to be an issue, however, this year’s talent was overwhelming. 5. Lastly, it has jumped the shark. If you don’t know this term, it comes from an episode of Happy Days where Fonzie actually jumped over a shark while on water skis. It is used when a TV show has reached its peak and is still on the air. In my, opinion the audience can seen how difficult it is to become a singing sensation and Idol is just the beginning of a journey. Mostly likely, we will not hear from the winner in years. It’s boot camp for singers and not a launching pad for Grammy greatness. Well those are my opinions. Let’s hear yours! Will Idol make a comeback or have we seen its glory days? I have to confess … I’ve never been a huge fan of Angelina Jolie. Her films are interesting but her life seems to be an incredibly hectic journey where she must be everything to everybody. She is involved in several charitable issues, has numerous children and is engaged to a movie star. Sometimes I would like to see another side of her where she is much more laid back. Today, Jolie made news by announcing she had a double mastectomy based on carrying the BRCA1 gene that causes breast and ovarian cancer. By having the mastectomy, she decreased her chances of having breast cancer from 85 percent to 5 percent. That shocked me. Two thoughts ran through my head. First, I was proud that a woman was taking control and making her own choice about her body and future. Jolie wanted to be there for her children and by having the mastectomy; she increased those chances. My second thought was sadness. Every day we see fundraisers for every type of cancer. Breast cancer awareness is everywhere. I wonder about the time, money and research going in to curing cancer. Is taking off our breasts the best answer? Where are we in finding a cure? What does a cure look like? So many women have chosen to have life changing surgeries speculating about forthcoming cancers. I understand their battle but is it a scapegoat to avoid finding a cure? Frankly, I don’t see men choosing to have surgeries to avoid testicular cancers. I’m proud that Jolie had the courage to make her choice and had family to support her, but I don’t want the headlining grabbing actress to discourage the value of early detection. Every woman must make their choice but let’s keep working on a cure. Yesterday was a sweaty and stressful day but it was not as hard as it used to be. I woke up early to the sound of my door bell ringing. I was confused until I realized it was moving day for my mother. The reason for this move is simple and life changing. About a year ago I met my true love, David. After date for 4 months, we were engaged and we are going to be married in September. For the past 5 years I lived in a townhouse with my older sister and mother. It was a convenient and cost-effective situation that I knew would change eventually. Yesterday, it finally did. My sister moved last winter and my mother made the move yesterday. Surprisingly, it was not a difficult move. 1. Be sure to pack everything and do it early. If you do this the movers just have to pick up the boxes and move the furniture. 2. Stay out of the way of the movers. Let them do them do their jobs. This includes moving and organizing the furniture. 3. You don’t need to unpack immediately. You can do this over the course of a week or two. 4. Be sure to pack an overnight bag. That first night can be hard and you will not be able to find anything. The bag ensures that you have everything you need within an arm’s reach. 5. Get pizza! Call the pizza delivery guy at the end of the day and rest! I’m back from the Romantic Times Convention. It was in Kansas City at the Crown Center. It is very entertaining. 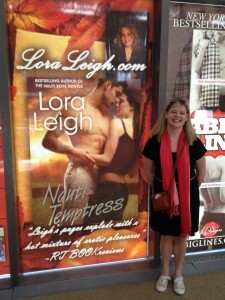 I’m a huge romance fan and was very overwhelmed by seeing all the readers and writers as well as cover models! I did a workshop about PR and authors. It was a lot of fun. If any of my attendees are reading this, feel free to write to me and get a 10 percent discount on products. Just mention to me what was the most important lesson you learned in my workshop. Here is a photo of me with my favorite author cover.